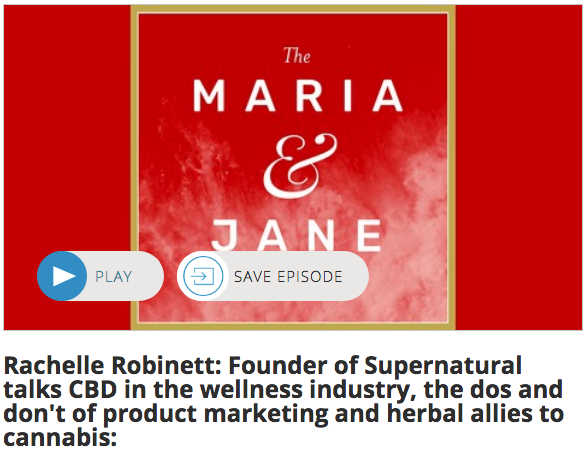 “This week I’m talking to Rachelle Robinett, Founder of Supernatural - a company dedicated to real-world wellness - that includes an herbal cafe, a product line of plant-based remedies, ongoing workshops and events, and personal health coaching. Rachelle also co-launched and manages the Bowery Cannabis Club with The Alchemist's Kitchen, and offers professional consulting for companies of all sizes. She is a plant-based wellness practitioner combining holistic, natural medicine with practical lifestyle work to help people find balanced, lasting health. Entrenched in the wellness world, but with an eye on the rest of the world, Rachelle brings a global perspective to individual health, and also that of businesses and brands.